Department of Accounting and Finance, University of Seville, Seville, Spain. 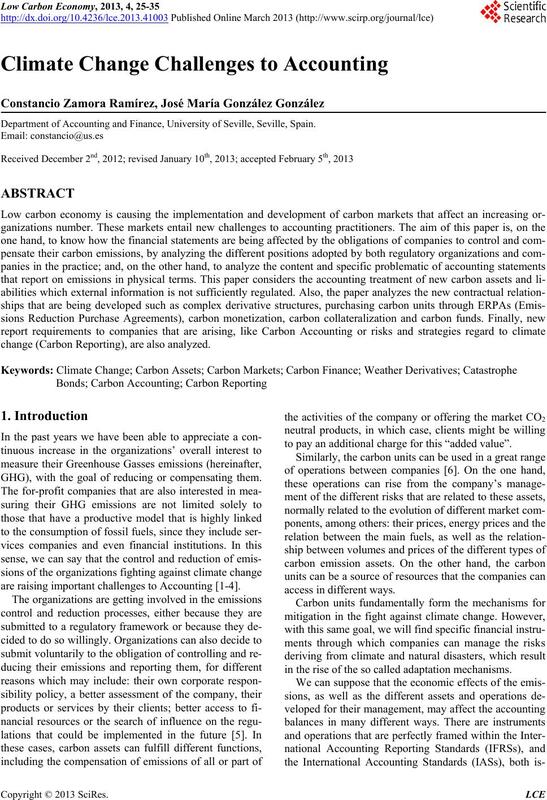 change (Carbon Reporting), are also analyzed. GHG), with the goal of reducing or compensating them. are raising important challenges to Accoun ting [1-4]. to pay an additional charge for this “added value”. in the rise of the so called adaptation mechanisms. 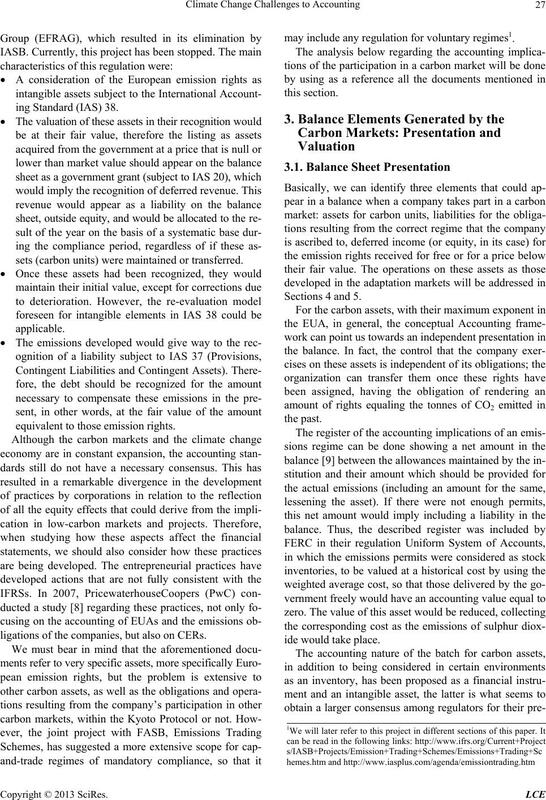 the accounting of emission rights. 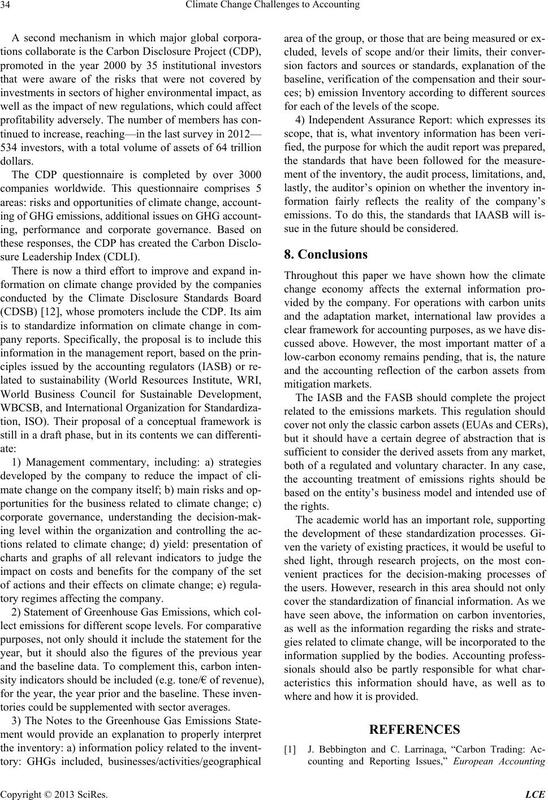 to climate change (Carbon Reporting). many companies that comply with the same. 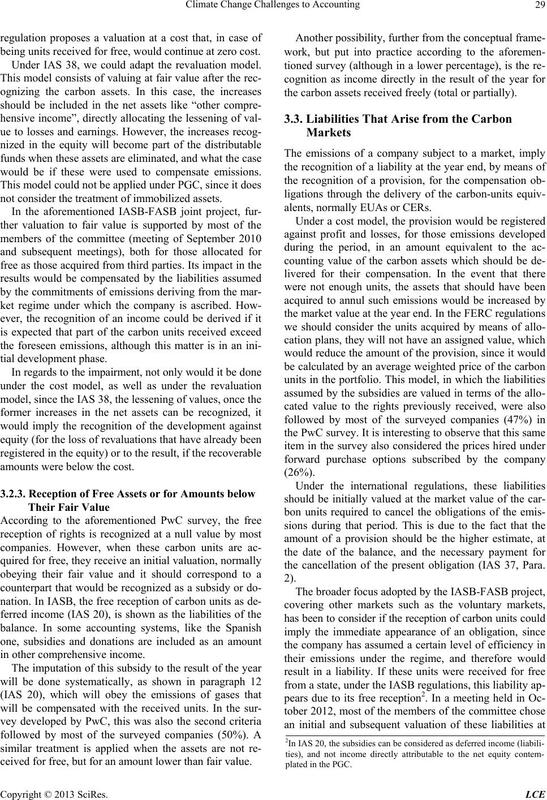 tion) with the rest of the FASB standards . 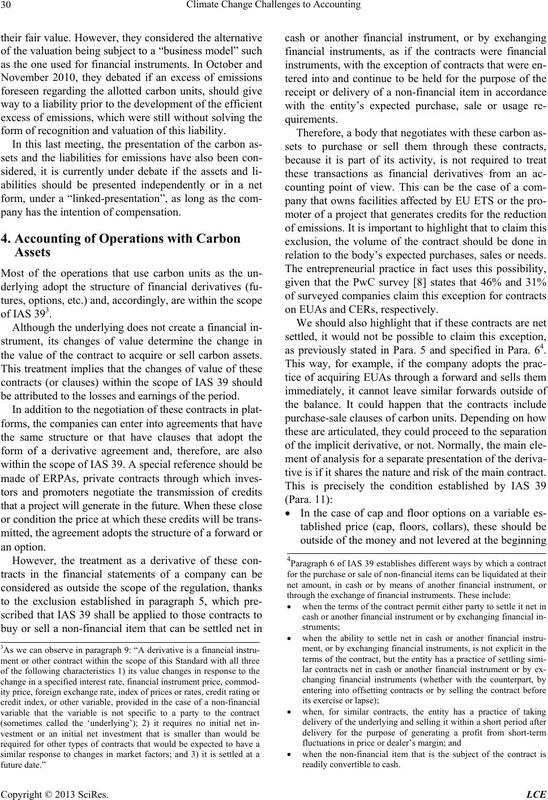 ing Standard (I AS) 38.
sets (carbon units) were maintained or transferred. equivalent to those emission rights. ligations of the companies, but also on CERs. may include any r e gulation for volun tary regimes1. sentation in the balan ce. these assets as financial instruments. or sale these rights in the ordinary course of business. production that is developed in this period. in the case of CERs, considered them as intangible assets. nature still has not been treated . ject with which it would obtain CERs, for instance. value, recognizing th e correspond ing exp loitation in come. tion for decisio n making. being units rec ei ved f or free , wo ul d conti n u e at zero cost. Under IAS 38, we could adapt the revaluation model. would be if these were used to compensate emissions. not consider the treatment of immobilized assets. amounts were below the cost. ceived for free, but for an amount lower than fair value. 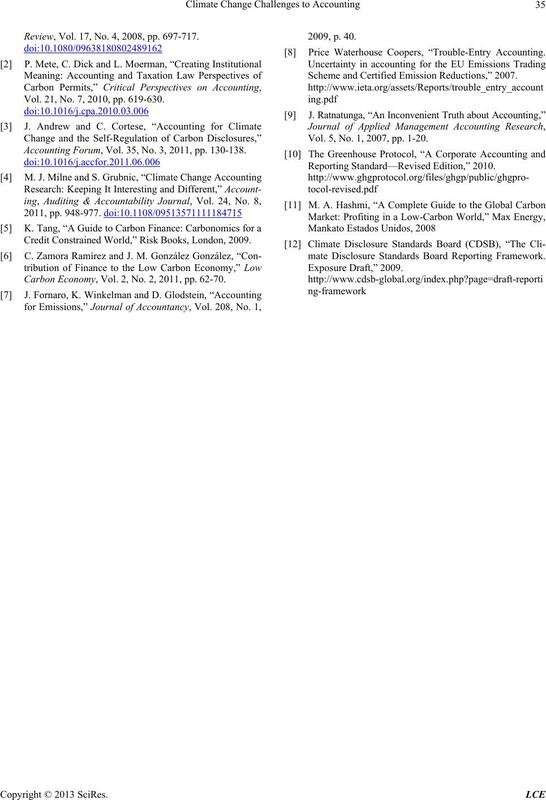 the carbon assets received freely (total or partially). alents, normally EUAs or CE Rs. the cancellation of the present obligation (IAS 37, Para. form of recognition and valuation of this liability. pany has the intention of compensation. 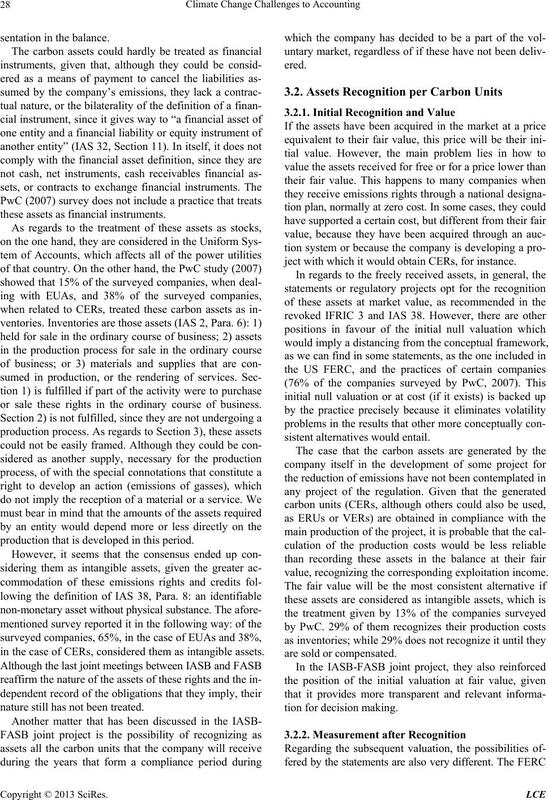 the value of the contract to acquire or sell carbon assets. be attributed to the losses and earnings of the period. relation to the body’s exp ected purchases, sales or needs. 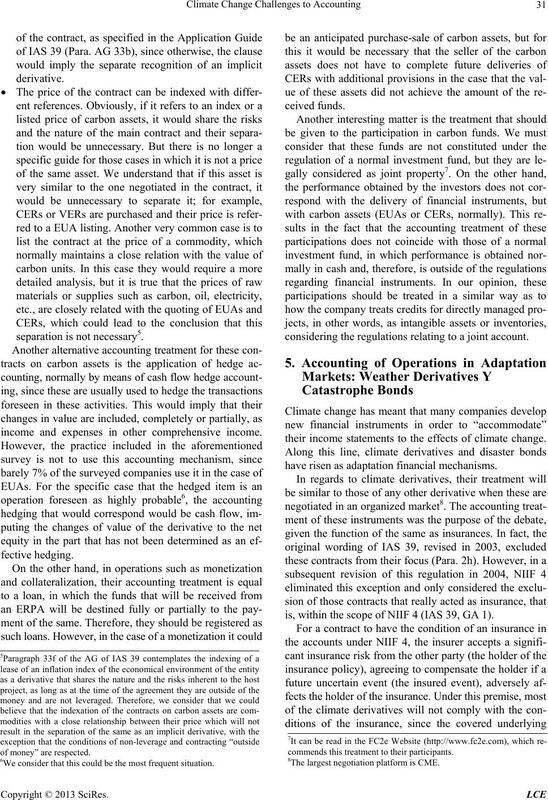 on EUAs and CERs, respectively. as previously stated in Para. 5 and specified in Para. 64.
tive is if it shares the nature and risk of the main con tract. income and expenses in other comprehensive income. considering the regulations relating to a joint account. their income statements to the effects of climate change. have risen as adaptation financial mechanisms. is, within the scope of NIIF 4 ( IAS 39, GA 1). 6We consider that this could be the most frequent situation. commends this treatment to their participants. 8The largest negotiation p l a t f o r m is CME. the holder suffered losses as a resu lt of the covered event. or interests that they would not have to pay. 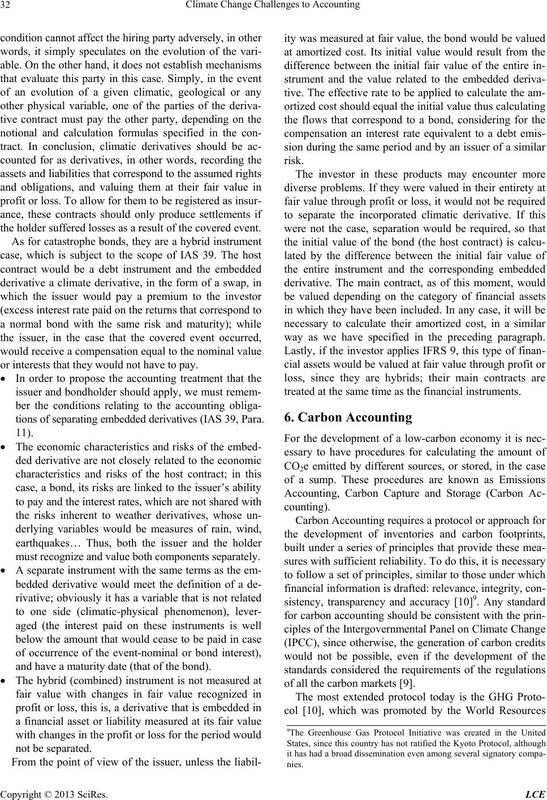 tions of separating embedded derivatives (IAS 39, Para. must recognize and val ue b oth components separately. and have a maturity date (that of the bond). way as we have specified in the preceding paragraph. treated at the same time as the financial instruments. of all the carbon markets . ity of these methods can be easily found. emissions that will be controlled in the inventory. specify this level with a limited scope. necessary in the field of carbon markets for two reasons. or Reviews of Historical Financial Information. of California, New South Wales or the UK . they do not require a very thorough detail (GRI, 2006). tory regimes affecting the company. tories could be sup pl e mented wit h sect or a ve rages. for each of the levels of the scope. sue in the future should be considered. where and how it is provided. Review, Vol. 17, No. 4, 2008, pp. 697-717. Vol. 21, No. 7, 2010, pp. 619-630. Accounting Forum, Vol. 35, No. 3, 2011, pp. 130-138.
Credit Constrained World,” Risk Books, London, 2009. Carbon Economy, Vol. 2, No. 2, 2011, pp. 62-70. Price Waterhouse Coopers, “Trouble-Entry Accounting. 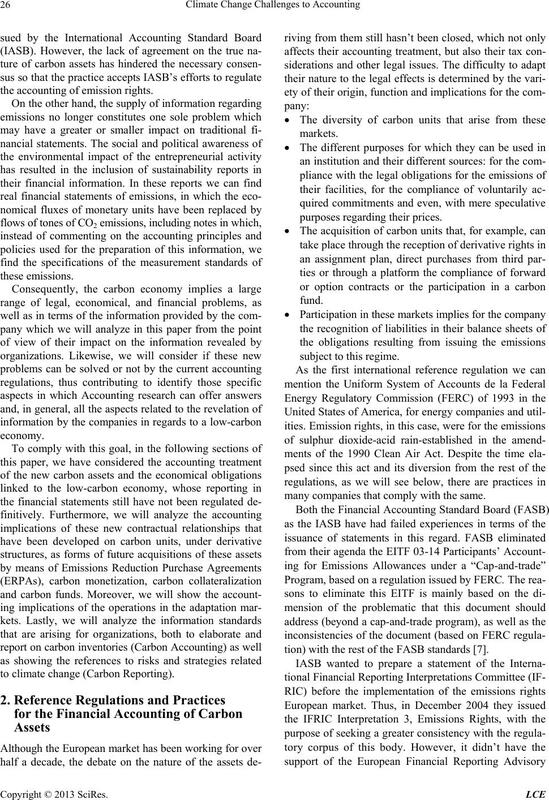 Scheme and Certified Emission Reductions,” 2007. Vol. 5, No. 1, 2007, pp. 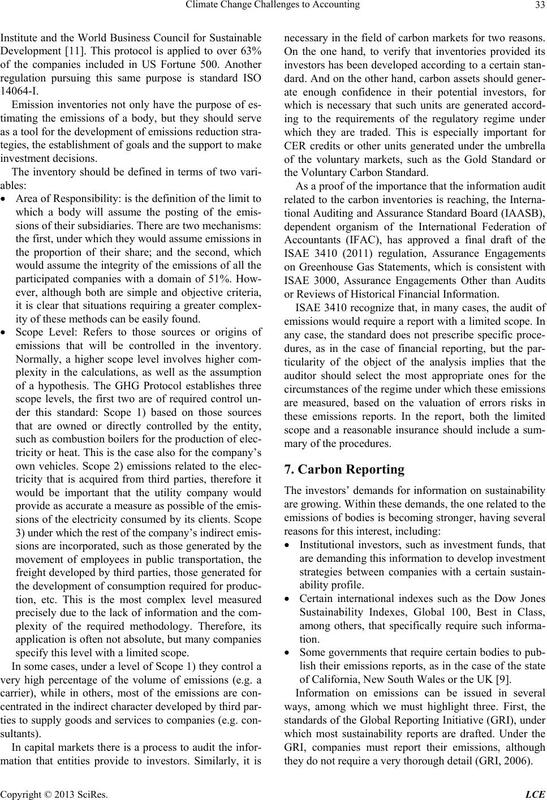 1-20.
mate Disclosure Standards Board Reporting Framework.